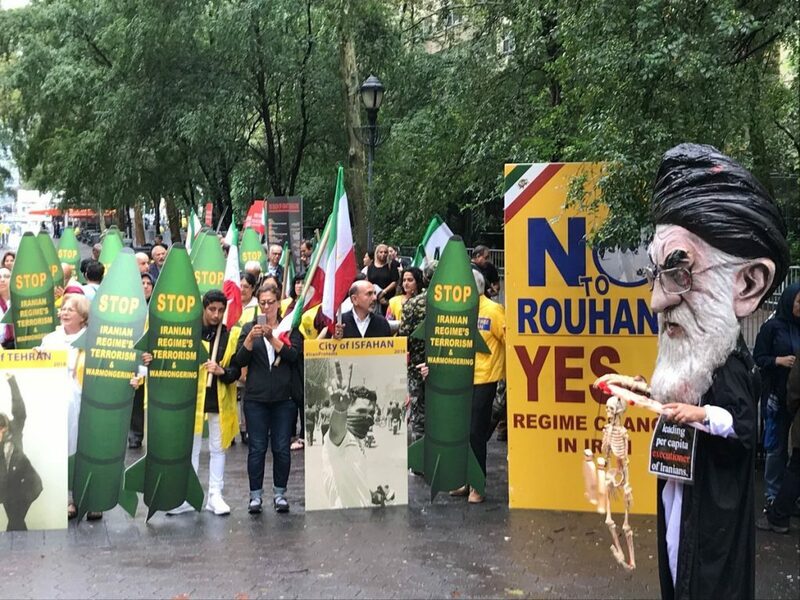 The Iranian diaspora, supporters of the MEK, rally in New York, opposite the United Nations headquarter to express their outrage over the presence of Hassan Rouhani in UNGA. 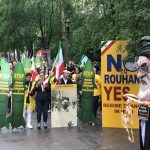 On Wednesday, September 26th, demonstrators at the Free Iran Rally in New York City rallied near the UN Headquarters in protest at the Iranian regime. Iranian President Hassan Rouhani was attending the United Nations General Assembly. The Iranian-American community and supporters of the Iranian opposition groups, including the People’s Mujahedin Organisation of Iran (MEK) and the National Council of Resistance of Iran (NCRI), gathered in front of the UN plaza. They recounted 39 years of repression under the tyrannical regime of the mullahs and called on the US and the international community to recognise the Iranian resistance as a viable alternative to the mullahs’ rule. Iranians suffer intense persecution, with strict restrictions on religious freedom. The US State Department estimates that more than 600 Christians have been imprisoned for their faith in the last eight years. The regime has adopted extremely violent and repressive strategies to maintain its position in power. The summer of 1988 was one of the worst periods in Iran’s history. More than 30,000 members of the MEK and the Iranian opposition were executed for their political beliefs. The executions are still occurring today. Iran executes more of its own citizens than any other country on earth. Since Rouhani came to power five years ago, more than 3,500 citizens have been executed. They also called for the international community to take concrete steps towards ending the mullahs’ warmongering foreign policy, nuclear development programs, and financing of foreign terrorism. "What do we want? Regime change in Iran"
"When do we want it? Now, Now, Now"
Guest speakers also pledged their support to the Iranian resistance movement. Pastor Linda told protestors, “Iranians have suffered enough!” and explained, “negotiations can no longer save the mullahs”. Senator Robert Torricelli also pledged his support to the throng. “Rouhani does not belong among the heads of state”, he said, adding, “he is a thug, a tyrant and a murderer”. "Turn your back on the regime & stand with the people of Iran." Torricelli also condemned the regime’s use of state-sponsored terror. He said, “Rouhani in June dispatched his own diplomats to plant a bomb to kill all of us”, referring to the failed terror attack on the NCRI’s Grand Gathering in Paris earlier this year. Torricelli also had a message for Rouhani. “We have given up on reform. You can’t fool us anymore with change or phoney elections… We want a free Iran”, he said. The protesters were adamant in their demands. They shouted that Rouhani does not deserve his seat at the UN General Assembly, suggesting that President-elect of the NCRI and leader of the MEK, Maryam Rajavi, should be there instead. Rouhani does not deserve to walk among other legitimate heads of state. He is a tyrant and a dictator. Instead of handshakes, he should be in handcuffs for the human rights abuses carried out against his own tortured population.